The spring concerts at the Andrew Carnegie Free Library Auditorium featured choral and instrumental music including several solos. They were events that we looked forward to every year. After many weeks of practice we finally could perform before our families and friends. Since the Carnegie Public Schools had no auditoriums, elementary and secondary school performances were always held at the library’s auditorium. In 1933 I was the fairy queen in a fourth grade operetta, “The Magic of Fairyland,” which was performed at the library. 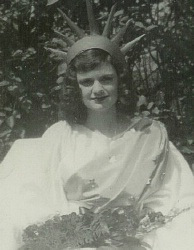 Later (in 1943), at the Carnegie High School Annual Spring Concert, I was crowned Senior Queen. Because the countryAdrienne Aldisert as a high school senior was in World War II and many Carnegie High School graduates had already been called into the services, the name was changed to Victory Queen. My senior picture on the right was printed in the Post-Gazette in May 1943. The caption under my senior picture announced that the spring concert would be held at the Carnegie Library auditorium. I had never seen the Carnegie Library auditorium mentioned in the Pittsburgh papers before! !